Carreño appeared in a Grand Concert with Edouard Remenyi (violinist) at Roberts' Opera House under the direction of Mr. F. Dulcken. Giovanni Tagliapietra (baritone) was also on the program. Carreño performed unidentified works by Gottschalk and a Hungarian Rhapsody [possibly no. 2] (Liszt, Franz). Tickets were priced at $0.50 for general admission, $0.75 for reserved seats, and $0.25 for gallery seats. According to the ledger book, ticket sales from this concert totaled $110. Advertisement: Hartford Daily Courant, March 31, 1879: 2. Announcement: Hartford Daily Courant, April 2, 1879: 2.
Review: Hartford Daily Courant, April 3, 1879: 2. 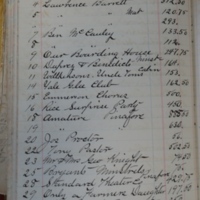 Ledger Book: Roberts’ Opera House records, 1871-1886, MSS 26034. Connecticut Historical Society. Please note that this image may not be published without written permission from the Connecticut Historical Society. Hartford Daily Courant, March 31, 1879. Roberts Opera House—Wednesday Evening, April 2d, Grand Concert! By the unrivalled Violin Virtuoso, Edouard Remenyi. Miss Teresa Carreno, The Celebrated Pianist, Signor Tagliapietra, The Brilliant and Popular Baritone. Mr. F. Dulcken, Musical Director and Composer. General admission 50 cents; Reserved seats 75 cents. Gallery 25 cents. The sale of seats is now open at the box office. Hartford Daily Courant, April 2, 1879. Remenyi Concert To-night. Remenyi, Carreno, and Tagliapietra are the attractions for this evening's concert, and the combination is a very strong one. Remenyi has been a decided success this season and was greatly admired for his genius and brilliancy on the occasion of his first visit to this city. This time he will display his artistic skill upon a Cremona violin, selected from the large and celebrated collection of Mr. R. D. Hawley of this city, who has kindly allowed Remenyi to use it to-night. Carreno is always admired as a pianiste and Tagliapietra is a splendid baritone. The prices are fixed at a popular rate, the sale of seats commencing at the box office this morning at 9 o'clock. Hartford Daily Courant, April 3, 1879. The Remenyi Concert. The management of the Remenyi company spread a splendid table last evening, but the Hartford public was not disposed to come forward and partake. Those who did come, however, were well rewarded. The programme was strictly popular, and there was not a weak or flat number. Mr. Remenyi is a great violinist, and drew from his noble instrument, the "King Joseph" of Mr. R. D. Hawley's collection, tones worthy of the mellow Cremona which he held. The gem of the evening in our judgment was the Schubert Serenade, which he played with a delicacy, smoothness and poetic feeling which could not be surpassed. Mr. Remenyi in the most of his public playing is given to effects rather than a solid and strictly musical style, but he plays with his instrument so wonderfully, as well as upon it, that he charms his audience. His control of harmonics is very remarkable; no player of the winter takes consecutive chords with such ease and grace. Teresa Carreno is an established favorite, and in a certain style, that of which Gottschalk's music is the best representative, she is delicious. She plays with a fire, a dash and a ring which are electric, and yet in her lighter passages she draws out the most liquid tones and the most delicate effects. The Hungarian Rhapsody has been seldom played better in Hartford than she gave it last evening. Mr. Tagliapietra has a smooth, clear and ringing baritone voice; he sings with perfect ease, and yet a nonchalance of manner which fails of the best effect. He gained a strong hold on his audience however and was greatly liked from first to last. Mr. Dulcken the accompanist may be said to be perfect. His is an ungrateful part, yet a man who does even the slightest work of a concert in a manner beyond criticism, merits more than a passing word. We can hardly overpraise the sympathetic background which Mr. Dulcken's plays afford for a fine singer like Mr. Tagliapietra, and an artist like Remenyi. “Roberts' Opera House (April 2, 1879),” Documenting Teresa Carreño, accessed April 22, 2019, https://documentingcarreno.org/items/show/168. Roberts' Opera House Records, MSS 26034. Connecticut Historical Society.